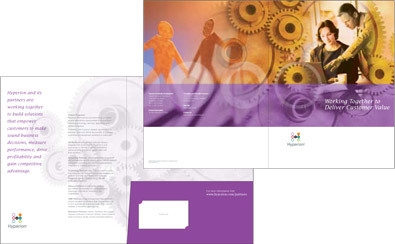 Presentation folders are one of the first representations of your business that people encounter. They can be a great way to organize your marketing materials and present them to a potential client or customer. Think of a folder as your baseline, similar to the homepage of a website. You want them to be versatile enough to be used with a variety of different marketing materials without having to be altered because of their content. Regardless of your audience, there are rules to follow when putting together your presentation folder design. You don’t want a folder that simply holds your marketing materials. Your folder is a piece of those materials; don’t just leave it blank. You’d never consider leaving your brochures blank. You should at least have your logo, business name, contact information and any other company details you feel may be critical. 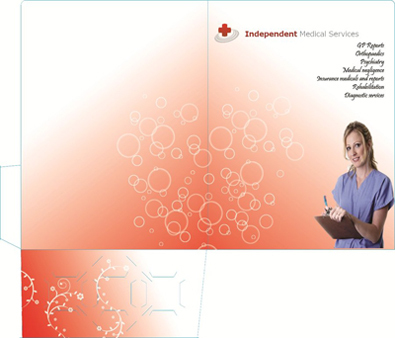 The placement of your design elements plays an important role in how your folder will be received by its audience. Don’t place your logo or other important information on the left 1/3 of your cover. This is the area where most people hold your presentation folder; you don’t want something to be covered up by their hands. Wherever you place your logo make sure that there is space left around it. You don’t want it conflicting with any other design elements. Use a minimum amount of text on the cover; limit yourself to one or two phrases, utilize the pockets on the inside if you need to relate more than that. The relationship between your logo, text and images is crucial. Contact information can go on the back cover, towards the bottom of the page. Don’t think you only have the cover to print on – use every surface. Both the outside and inside of the front and back covers (as well as the pockets themselves) all are surfaces that can be filled with color or other design elements. Too much text on the outside of your folder almost always ensures a conflict with the information inside. Remember, your folder is a baseline for your marketing materials. You want to be able to change its contents without worrying about contradictions with the folder itself. Most of your clients and customers are not going to want to read a lot of copy on the presentation folder. They’re going to be more interested in the information your folder contains. As a result, text needs to be short and to the point. Leave longer explanations for brochures and other documents. An overly complicated folder will detract from the message contained inside. By limiting your cover to your logo, a minimum amount of copy, or select design elements including images, it keeps your piece simple and elegant. The right image is worth a thousand words. Along the same lines, try not to go over the top with your use of color. Choose a few that are well thought out and keep them in line with your other marketing materials and branding. Remember, you want your folder to have a focal point. Try to design it around a key element that will give it focus and purpose. There should be a key element that it’s designed around that will give it focus and purpose. On the other end of the spectrum, you don’t want your folder to be so reserved that no one will be interested in what you have inside. Strike a balance. Simple design doesn’t mean design that lacks impact. Use images and graphics that relate to your business. Use colors that will attract attention without taking away from what you’re trying to say. Your presentation folder should not feel as flimsy as a piece of paper. If you use too light a stock, you’ll find it won’t be sturdy enough for the materials it contains and could also allow ink to bleed from one side of the page to the other. 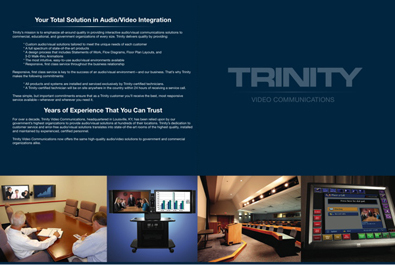 The touch and feel of your presentation folder is as important as your design. Your folder is something physical and tactile, not just something you view on a screen. Also consider whether you’ll use a gloss or matte finish on your folder. Gloss looks good but can show fingerprints and smudges. Matte is very stylish but doesn’t always command attention. Discuss with your printer what options you have for the weight and style of your paper stock. Too heavy or modified a stock can become cost prohibitive. You always want to make sure that you’re working from a template that your printer has given you. While you want your folder to be a custom design, you also want to make sure that it’s compatible with the die cut templates your printer uses. Also, remember to be aware of the elements that make up your templates. This can be a huge waste of time for both you and your printer. Review all of the information that the printer requires before you start designing your folder. You might find this prepress checklist for graphic designers helpful. There’s nothing worse than completing a layout only to realize that it needed to be done with a program you don’t have. Unless your printer specifically ask for something different, it’s also best to send native files of your work, such as Photoshop, InDesign, Illustrator, etc., and to include all of your document fonts and artwork. Avoid costly mistakes like these and you will be off to a good start. Make sure, especially if this is your first time designing a folder, to give yourself enough wiggle room to meet your deadline.